This episode is dedicated to weddings, marriage, and all things matrimony. 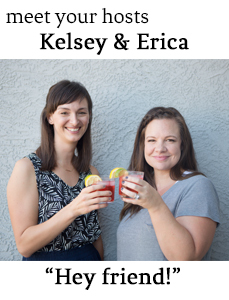 We're sipping on a listener-inspired cocktail to kick things off! We both celebrated big wedding anniversaries recently so we recall our favorite details from our wedding days and honeymoons. 1. What would your spouse say is the hardest thing about being married to you? 2. What would they say is the best thing? 3. Who takes longer to get ready in the morning? 4. What is your spouse’s favorite meal? 5. What do you fight about most often as a married couple? In current obsessions, Kelsey can't stop eating quinoa and eggs, and Erica is loving dressing her new daughters in hair bows and Saltwater Sandals. In Neighborhood News, Kelsey finally spotted the mythical Rollerblading Guy! We may have the friendliest neighborhood Walgreens cosmetic counter lady ever, and Kelsey is lobbying hard for a Whole Foods. Don't forget we are reading We Were Liars for our summer edition of The Girl Next Door Book Club. It's a great beach read so please join us!